Now days, the Google Web spam team has become more dramatic with their Algorithm updates. From time to time, we have witnessed not only old but new Algorithms getting updates. Past Week, was the perfect example of Google’s dramatic approach in which they updated almost three of their search algorithm which includes, Panda 20th, Penguin 3rd and EMD (Exact Match Domain) Updates. This is not the end of the fairy tales, because Google has just bombed webmasters with the Page Layout Algorithm. However, it's not a fatal algorithm when we compare it to Panda and Penguin. The main idea behind it is to keep balance in between the layout and the content of a webpage. 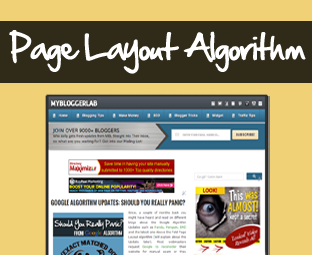 Today we will talk about the recent Page Layout update and would also answer whether you should panic from it. Since, we all know that a webmaster creates a website for the sake of generating a decent revenue from it. However, he didn’t care about the fact that his visitors might get annoy from unwanted advertisements. According to Google, “We are consistently getting so many complaints from our users that when they click on a result they either have to face a website with tons of advertisements or it’s difficult to find the actual content, they aren’t happy with the experience. Users want to read the content straight away rather than scrolling down page past a slew of ads”. It means that those websites, which are placing ads above the content, would face some serious damage. If you visit a website that has lots of advertisement and slightly less content above-the-fold then it’s not a decent user experience. Such website may not rank well in the Search Results. We Should Completely Avoid Advertisement? Placing ads above the content is quite common for websites. Placing ads on such places increases the revenue and an advertiser receives the maximum exposure. The Algorithm change doesn’t affect those sites which are placing ads above-the-fold to a certain degree (Normal). However, it will affect those websites that devote their above-the-fold for their advertisements. This Algorithm tends to improve user experience by giving less importance to those websites that places ads on top, or relevant content is extremely down the page with large block ads. We are quite surprised to see that it is the first refreshment because Google may have done this a long time ago. However, this Algorithm refreshment affected less than 1% search quires to a noticeable degree. To protect your site from getting penalize shuffle your content up and push your ads down. Moreover, use Google’s Browser Size Tool to check how your website appears on different dimensions (Resolutions). In the following screenshot, Matt Cutts is confirming about the refreshment. If you have decided to update your page layout, Google crawlers will automatically check your page and would report to the web spam team to remove the manual spam. However, you can also use a reconsideration request (After doing changes). You have to maintain patience, because it will take some time, but every single SERP ranking will be back. Webmasters were in terror because of Pandas, Penguins, EMDs, and now they have to face the music of Page Layout. However, we still feel that these Algorithms could not do anything to your blog, only if you follow the MBL’s Four Blogging Pillars. What do you think about this Page Layout Algo, are you afraid from it? Share your opinion via commenting. Take a lot care of your family till then peace, blessings and Happy Googling. All authors are facing a Blog Pageviews Error !! Recent alogrithm update has opened the eyes of pro bloggers while SEO savvys found hiding their faces on one pretext or the other. I run total seven blogs and almost all of their front-page keywords received a big hit in last week. We have to rationalize our blogging attitude and instead of going crazy in optimization and monetization we have to adopt a balanced approache with long-term approach of succeeding. Google now day very strict. google wants to provide good website for our visitor. really i like google. I think Google trying to refresh Search results. Hey bro! Need your serious help. I recently viewed your post of "Customizing your mobile template" by GOMO or whatever. I just followed every step but couldn't figure it out why it didn't worked! Please give me your email id so that i could send you my template junk! Thanks for the Critics, What do you want to see in the Sidebar. We feel that its just perfect. If you have any Superb ideas than we would surly implement it. Peace Buddy. Well We all Really LOVE Algos When they love us. However, When these algorithms started to hurt us at that point, we just change our point of views and that's really wrong. I Take Algorithms as my friends because they are penalizing a certain site for its betterment. Love Your Content and Algorithm will Love you"
Why is every comment has to be Critics? Well! We take each and every reply as an Advice. But I Think you have not read the Complete Article because we have mentioned that you are free to place as many ads as you like But they should be covering your whole content. We are using ads in the sidebar because we don't want to interrupt people while reading our content. We have also removed the ADS that were in the starting of the article. So we have already implemented those things that we are suggesting to our readers. The key thing is not the amount of Advertisements. They key thing is that Content should be above the every one. Hope you can understand that. i totaly agree with you.. really informative and intresting blog :) good work keep it up.